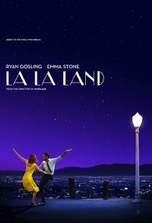 During the opening musical number in La La Land, appropriately staged on a L.A. freeway, I thought: “Dear God, what have I gotten myself into?” Based on that intro, I thought the remainder of the movie would be comprised of similarly elaborate musical numbers performed at regular intervals throughout the film. Much to my relief, I was wrong. The movie quickly transforms into an engaging romance/drama with only the occasional song and dance number interspersed throughout the narrative. What ensues is a follow-your-dreams tale where Sebastian (Ryan Gosling), a struggling piano player, wants to open his own jazz club and Mia (Emma Stone), a frustrated barista, wants to become a famous actress. Writer/director Damien Chazelle cannily delays the romance between Sebastian and Mia by arranging a series of anti-meet cutes, which should be a sign to the couple that their love affair is destined to be ill-fated. Casablanca (1942) is referenced a few times in the film and holds obvious significance for the star-crossed couple, particularly in how both films end. LLL seeks to tap into the brilliance of such masterpieces as Casablanca for its dramatic passages and Singin’ in the Rain (1952) for its musical routines. The film is brimming with classical Hollywood nods like the old film posters that adorn the walls of Mia’s bedroom and the Sebastian and Mia’s screening of Rebel Without a Cause (1955) at the Rialto Theater. As such, LLL is a reimagining of the Hollywood musical, a largely retired genre. Ironically, relying so heavily on Golden Age Hollywood themes and iconography has proven to be a double-edged sword for the film. On the one hand, the heavy quotation of vintage films has established the film’s look, mood and atmosphere as well as produced feelings of nostalgia in viewers enamored with such films. On the flip side, it could be argued that the film relies too heavily on early Hollywood tropes and that such an effort was done intentionally, to play on viewer’s emotions and to pander to those in the industry, particularly Academy members. Either way, LLL fails to achieve its goal since it doesn’t adhere to classical modes of storytelling. Indeed, the movie is a mélange of genres (comedy/drama/musical/romance) and is, perhaps, too ambitious for attempting to combine so many disparate story elements. One of those aspects is the jazz appreciation subplot. Whereas keeping the arts alive is an important endeavor, the obvious validation of jazz as an essential, vibrant art form is foisted on the audience and such advocacy is just one more objective the film tries to accomplish. Though many of the film’s romance scenes feel trite, Chazelle’s concluding “the life that would have been” parallel action device is brilliantly executed and infuses the film with an unexpectedly bittersweet resolution. In the end, LLL’s story is the only thing that holds it back from becoming an instant classic. The film’s directing, acting, production values, locations, cinematography and music (especially Justin Hurwitz’ “City of Stars,” which has a wistful “Moon River” quality) are all off the charts. Gosling and Stone’s (in their third movie collaboration) screen chemistry is so searing it nearly makes the film melt, something that actually happens during Sebastian and Mia’s screening of Rebel. There’s far more that works here than doesn’t, and at the end of the day, the film’s unique vision has broadened the appeal and potential for the modern musical. LLL seems to be a strong contender to win Best Picture. It just depends on what Academy voters are in the mood for this year: depressing drama (Hell or High Water, Manchester by the Sea, Moonlight), historical biopic (Hacksaw Ridge, Hidden Figures), inspiring true story (Lion), space invasion flick (Arrival), converted stage drama (Fences), or this film. We’ll find out soon enough. Tapping Christopher Walken for this film was a casting coup. He was born to play this part…an absolutely pitch-perfect performance. Three ways out of the neighborhood, two types of women. A severe world. My parents were born and raised in that world. I’ve spent my entire adult life trying to divest myself from such a rigid worldview. Jam session on the organ is a cool scene. But comes with a price. Manually loading bowling pins...what a job. And the identity of the young teenage boy loading the pins is sure to take you by surprise. A gift for the newest member of the group...a left shoe. If you sense a sleight, you sense correctly. “The musical equivalent of room service.” Always read the fine print. The Four Felons get tossed out of the bowling alley, but a “sign” changes their fortunes. Actually, The Four Felons, cast as an aspersion, is far better than the group’s original name…The Four Lovers. As a male quartet, did they not consider how such a name could be misconstrued? Ah, the innocent 50s. A “Jersey contract” threatens to tear the group apart. Valli’s pep talk to his daughter hits the right emotional chord. And is really the only scene in the movie that contains any emotional resonance. Final analysis: a well crafted spotlight on Valli and his group. Rating: 3 out of 4 stars. An immersive film that captures the sound and mood of the period in focus. I must admit, I’ve never been much of a Frankie Valli fan. His high falsetto work, especially on songs like “Walk Like a Man,” is like fingernails on a chalkboard to my ears. Musical preferences aside, I’m now a fan of the singer, thanks to the insightful portrait of Valli’s life and career, brought to us by the man who once tried his hand at singing in “Paint Your Wagon” (1969) and then wisely stuck with his day job. It’s evident that Eastwood has a profound affection for the subject matter and his attention to historical detail is peerless. The film is saturated with nostalgia for the music and mores of the 50s and 60s and the sets, costumes, cars, etc, are all period appropriate to a superlative degree. Those familiar with Valli’s greatest hits will find it nearly impossible to refrain from singing or humming along when snippets of those songs, played in chronological progression of course, blast from the theater speakers. Despite the many qualities that recommend the movie, however, it remains strangely unmoving. The same can be said of Eastwood’s previous directorial effort, J. Edgar (2011)…a finely mounted and acted period piece that provides a vivid history lesson without really engaging the heart in any meaningful way. Eastwood needs to reevaluate Changeling (2008) to see what’s been missing in his recent films. The story here is remarkably similar to that of a concurrent group, The Temptations (as chronicled in the 1998 self titled TV miniseries). It seems that many popular acts from this era had a meteoric rise to fame followed by a catastrophic meltdown, instigated by the group’s requisite prima donna: David Ruffin for The Temptations and Tommy DeVito for the Four Seasons. But besides the group’s internal drama and Valli’s relational challenges on the home front, this movie resides on the outskirts of substantive emotion. 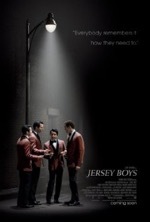 Indeed, despite the film’s ability to engage the ear (music) and mind (human interest story of a group of guys trying to parlay their talent into fame), the movie plays like a Lifetime movie (with a ton of expletives added) punctuated by dramatized Time Life archival music video clips. As things stand, the movie is a finely produced “true story” that’s memorable more for its music than its standard story or static direction. If you’re in the mood for this type of movie, Jersey might satiate your hankering; otherwise you’re sure to be disappointed by its predictable plot and surficial story. In other words, you might want to save your money and make this one a rental. Capiche? Personal note: My uncle was lead trumpet for Valli’s touring group for a couple years in the mid-sixties, so it was fun for me to get a glimpse of what his life might have been like during that stretch of time. Love the part writing on the opening choral number. Gorgeous animation on the ice breaking scene. The king seeks aid from rolling rocks. There’s a really good rock ‘n’ roll joke in there somewhere, but chances are it’ll end in a groan. And neither of us wants that. “Do you want to build a snowman?” Wow, what an emotionally charged back story. This heart-rending sequence approaches the master level storytelling exhibited in the opening montage of Up (2009). Boy does it hit the mark. Water fountain ice sculpture and walk across the lake are brilliant. There’s some superb animation in this section of the film. My God, the “frozen fractals” CGI is utterly jaw-dropping. Ditto to the previous remark times a million. Olaf dreams of summer. Funny how we always long for what we can never have or will lead to our destruction. Just human, or snowman, nature I suppose. The duet by the sisters reminds me of the “Defying Gravity” song in Wicked. Fitting since one of the singers in that song also lends her voice here, Idina Menzel. Ice queen gives her sister a snow lock like Simon in #TheDragonboneChair. This book, the first in a trilogy written by Tad Williams, should be essential reading for fantasy lovers. “My own personal flurry.” Hilarious! Unlike many of the cutesy sidekicks in the 90s and 00s Disney movies, Olaf doesn’t work too hard to be funny…he just is. He’s also charming, which is more than I can say for many of the “comic relief” characters from the period in question. Final analysis: a beautifully rendered animated film that features some funny and touching moments. This film is the perfect marriage between classical Disney magic and Pixar’s storytelling brilliance. If Disney wants to regain its dominance in the industry, this film should serve as a template. Rating: 3 1/2 out of 4 stars. Pure animation excellence and well deserving of its Oscars. Of course, it’s easy to gush in retrospect, but this film certainly deserved the Oscars it won back in March, including the coveted Best Animated Feature Film. Thanks in large part to the creative guidance of John Lasseter, the gap between Disney and Pixar animated films has significantly narrowed. More homogeneity exists between both animation houses at present than ever before and it just makes sense that Disney/Pixar films should possess the same level of quality and creative consistency across the brand…the results have been largely lopsided until now. 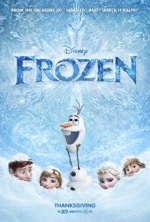 Besides the eye-popping CGI, there are also plenty of other things to celebrate in the film, not the least of which is co-director Jennifer Lee’s screenplay based upon Hans Christian Andersen’s “The Snow Queen.” There are many classical Disney flourishes in the film along with some fresh elements too, like the clever twist on the hackneyed story device where a character can only be reanimated by “true love’s kiss.” The movie boasts the finest musical numbers in any Disney movie since Beauty and the Beast (1991). There isn’t a wasted word or note in any of the songs and “Let It Go,” performed by Menzel, justly deserved the Oscar win for Best Original Song. As incredulous as it seems, this is the first Best Animated Film Oscar bestowed upon the Mouse House: since its inception in 2002, the category has been dominated by Pixar. In truth, I’m much more of a Pixar fan than a Disney fan, but I must admit to being completely won over by the film’s charm, heart and visual grandeur. There can be no doubt that Frozen is a giant step in the right direction for Disney. Hopefully, like iron sharpening iron, the two studios will push each other to greater artistic and dramatic achievements in the future. A little sibling (studio) rivalry never hurt anything, right? Guess I should show more respect for the little green guy. After all, he has a star on the Hollywood Walk of Fame. I know ‘cause I’ve seen it. Really amusing Monsters University short. Clever opening number about sequels. Did anyone catch The Seventh Seal reference? One of the lines suggests that this is the seventh film since the original movie. My higher math tells me that there are now eight films in the Muppets series. Certainly a respectable franchise, although it has a long way to go to catch up to James Bond. Badguy proposes a world tour. What could possibly go wrong? “Drum solo!” Animal is a crackup. Don’t worry; he eventually gets his solo…which lasts two hours. Thank God for editing. Christophe Waltz dances the waltz. Doesn’t get any more tongue-in-cheek than that. Correction: No “e” in Christoph. Kermit receives a spork crown at the gulag. Some people wait their whole lives for such an honor. Liotta and Trejo doing dance moves is a bigger gas than Chris Cooper doing rap in the last film. The prison ballet scene is just plain wrong. These Cabbage Patch Muppets are creepy looking. They look like Chucky’s illegitimate children. Piggy sees double at her wedding. The doppelgänger subplot is older than dirt, but keeps finding its way into movies. Final analysis: just what you’d expect from a Muppets movie...lots of gags, pratfalls and inside jokes. With puns and one-liners to spare. Rating: 2 1/2 out of 4 stars. Not as heartfelt as the previous film, but just as entertaining. 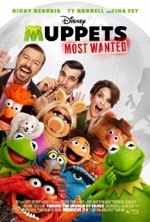 The previous film in the series, The Muppets (2011), was a valentine to the fans and franchise. The movie was delivered with undeniable reverence and passion by co-star/co-writer Jason Segel (TVs How I Met Your Mother), who is a lifelong Muppet lover. The new Muppet introduced in that movie, Walter, was clearly envisioned as a Muppet version of Segel’s younger fan boy self. Though Walter also appears in this film, his involvement is in more of an ancillary capacity. 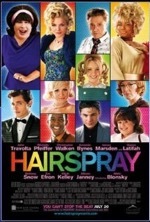 Even though it’s just as amusing, this movie isn’t as from-the-heart as its predecessor. But that isn’t to say it’s without entertainment value. Fey, Gervais, Ty Burrell and a slew of high caliber performers in cameos infuse the movie with sufficient star power and the laughs keep coming at a steady clip throughout the movie. The Spartacus inspired scene near the end of the movie, where all of the Muppets offer themselves up for imprisonment so that they won’t be separated from Kermit, is definitely an emotional high point. All in all, this movie is diverting, family friendly fare that should fill the bill if this is the kind of entertainment you’re in the mood for. In the end, Muppets Most Wanted is exactly what you’d expect it to be. And in this instance, that’s not such a bad thing. Having never seen the theatrical version of Mama Mia! I didn’t know what to expect from the new film version, other than I was going to see a musical. And a musical it is; songs permeate and dominate all but about fifteen minutes of the film, so if you’re not a person who enjoys musical movies this definitely isn’t for you. As an unrepentant Chick Flick and an uninhibited musical, the film is clearly marketed toward the female set, so most men (those dragged kicking and screaming into the theater by their female companions) will have a hard time swallowing or following the movie’s song-a-minute storyline. The movie’s slogan is: “A Mother. A Daughter. Three Possible Fathers.” Believe it or not, that’s about all there is to the plot. The vast majority of the story is told via nineteen songs from ABBA’s catalog—some bouncy, some groovy—which are sung by the stars along with a host of extras performing over-the-top choreography and wearing Juicy Fruit smiles. Of course, after about the fourth or fifth musical number all of the songs start sounding like a broken record…er 8-track, and while I applaud the film’s use of the actors’ actual singing voices, some of the solo work is flower-wilting bad. Besides the movie’s overabundance of musical numbers, the biggest disappointment is the utter absence of character moments. However, the acting, directing, music, choreography and technical elements make up for any lack in the story department, and the on location filming on an idyllic Grecian island is a significant factor in the film’s overall mood and aesthetic. The movie’s casting was spot-on and veterans Meryl Streep, Pierce Brosnan, Colin Firth, Stellan Skarsgard and Christine Baranski, along with newcomer Amanda Seyfried, deliver delightful performances. Streep is her usual stellar self as mamma-with-a-past Donna, but it’s Seyfried as Donna’s debutante daughter, Sophie, who steals the show with her zest for life and inextinguishable desire to discover her dad. In a strange case of role reversal, Sophie provides maturity, responsibility and just good common sense to balance out her flighty, wild and emotionally needy mother. Though the movie stays on the periphery of meaningful issues like empty-nest syndrome, regret over lost love and paternal responsibility, it wastes much of its efforts on bawdy jokes and obscene gestures; most of them perpetrated by Donna and her lusty gal-pals. Mamma Mia! is a light, breezy jukebox musical that fulfills its promise to be a two hour dance party and is the feel-good movie of the summer. It’s a story about young love and rekindled love; in fact, it’s all about love. How fitting that, despite its vacant narrative, Mamma Mia! is a movie you can’t help but love.